Building wealth, I mean creating the kind of wealth that puts you in the top one percent, means developing income source that generate cash flow whether you work or not. 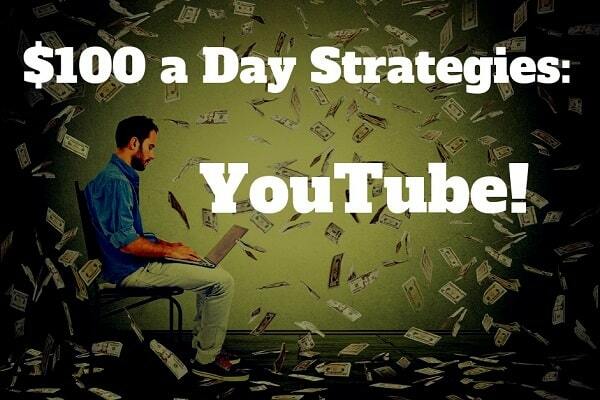 In this video, I’m revealing five strategies anyone can use to make 100 dollars a day online. Not only will I detail how to get started but I’ll show you how long you can expect to take before reaching that 100 a day in passive income. One of the most common complaints I get in the investing videos on the channel is that people just don’t have any extra money to invest. I know the frustration. After getting out of the Marine Corps, I was living paycheck to paycheck and felt like I was missing out on being able to invest. That’s why I wanted to share five of my favorite strategies for making $100 a day online. Now $100 may not seem like much. It’s just three grand a month so it’s not going to make you rich but invest that money and it will make you a millionaire in 16 years. That’s a seven-figure bank account by 2034 and anyone can do it. We’ve talked about business ideas and side hustles on the channel before but what I want to focus on here are five strategies for passive income. Five ideas you can start, put in just a little time to get them going and then have that $100 a day income stream without having to do anything at all. That idea of passive income, making $100 a day on top of your other income, is a powerful wealth builder. I’m going to showing exactly how to get started in each of these strategies and how long to reach that passive income stream. At the end of the video, I’ll also be revealing three secrets to making money online. These tips are going to help you unlock that $100 a day payday no matter which strategy you choose so make sure you watch for those. 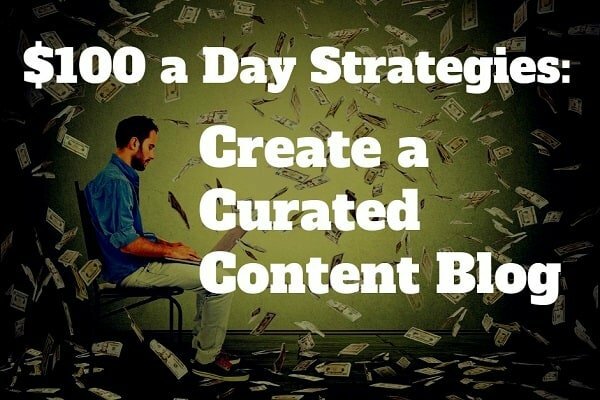 Our first hundred dollar a day source is going to be through a blog, but not any kind of blog, a curated content blog. Now I’ve come out against all the passive income blogging videos promising six-figure paydays with no work. Blogging is a business and can make you millions but it takes at least part-time work every week. A curated content site is different though. Here, instead of constantly having to write all your own articles, you just curate content from other blogs to post to your site. You provide a link to the original blog but can add links in the content to affiliates or ads to make money. It was four months into running my blogs before I even started thinking about putting up the ads and making money. When I did start making money, it was a fast ride to hundreds a month and took seven months until I was making over $100 a day on average. With a curated blog, you can speed this up because you’ll be posting more articles to the site and getting more traffic. It costs less than $50 to set up a blog including a year’s hosting and some paid plugins. In fact, you can get started on less than $4 a month with Bluehost for webhosting and get up to $200 in advertising credits. Now I’d usually say stick with a topic you’re passionate about or a hobby for your blog because most blogs mean you’re going to be writing about the topic a lot. For a curated blog though, you want to stick with the topics that make the most money. So here I’m thinking things like insurance, loans, credit. Topics that will make you a lot of money in ads and affiliates. You can find these topics by doing a Google search for most expensive adwords. Once you’re blog is up, start applying on affiliate networks like CJ and Share-a-Sale. This is where you get the links to put in articles so if someone buys a product or service, you get a commission. Finally, just start reading some of the best blogs in the topic. Your readers are going to appreciate that you’re taking the time to share the best articles with them and your traffic will start growing fast. 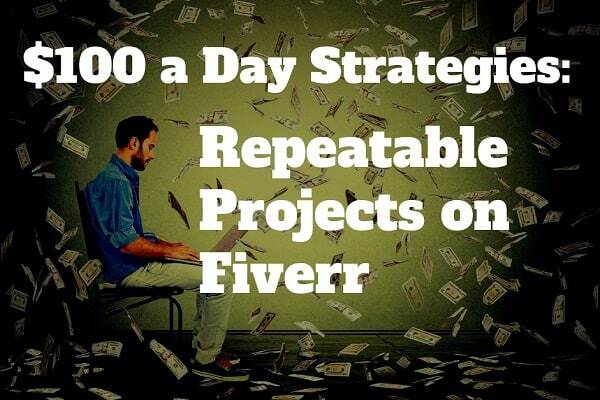 Our next $100 a day idea is setting up a repeatable project on Fiverr. Fiverr is a freelancing platform where you offer to do a set task for a set price, anywhere from $5 to hundreds of dollars. I love the platform because you can set up easy, repeatable projects that you can sell over and over again. You might customize the task a little depending on your customer but making it passive means providing something like a checklist, a worksheet or a process that can be easily repeated quickly. It used to be that $5 was the most common price for gigs on Fiverr but now I see more $10 and higher projects than anything. That means you need less than 10 customers a day. Even if it takes you five or ten minutes to customize and respond to each order, that’s less than an hour to make $100 dollars. Again, the best projects here are ones that are easily repeatable and that take as little time as possible so go to Fiverr and browse around to see what you might offer. This is a great one to pair with the two blogging ideas we’ll talk about because you can advertise your Fiverr project on the site. That’s going to give you a steady source of customers plus you’ll get some directly from Fiverr. Those three secrets to making money online that I’ll share at the end of the video are really going to come in handy with this one. I’ll show you how to turn Fiverr into a business and how to get ideas for projects to offer so stick around for those. Our third $100 a day idea won’t come as a surprise to those of you in the community, self-publishing and printables. Self-publishing has been easily my best passive income source and getting started is easier than you think. I’m going to share my process for putting together a 150-page book in less than three months and printables are even faster. You can do a one- to ten-page printable in less than a week. I have ten books self-published and average just under two grand a month or about $180 a book. 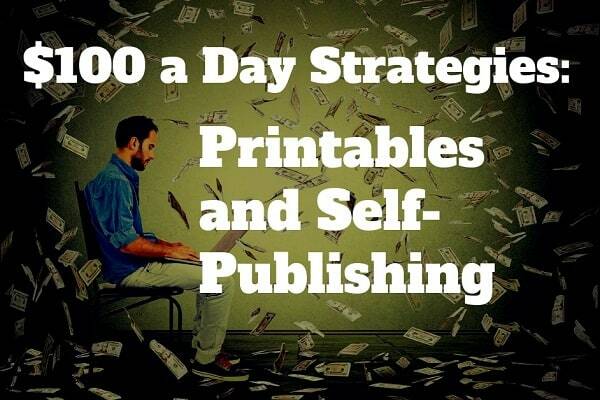 So you’ll need quite a few books to be making $100 a day but you’ll start making money immediately after publishing your first book and will make more every time you publish another. Everyone has a book inside them and I guarantee you do too. Browse Amazon to get ideas on what you might write about whether it’s a fictional story or non-fiction how-to type of book. Just start looking around that the topics that interest you and it won’t be five minutes before you start getting ideas. Then spend a week reading up and getting ideas for your book. The easy way here is to look at other books, what they’re talking about and doing a google search to see what’s online. You don’t have to reinvent the wheel here. Don’t worry that you don’t have anything extra to add to the subject. Just learn as much as you can about the topic and then put your own voice and experience to it. Another hack that I’ve used writing is to look at the buyers’ reviews on Amazon to see what people liked and what more they wanted from the book. Writing your book, don’t sit down to write the whole thing, it’s too much. Start from the transformation you want your readers to achieve and then work backwards in the steps to get there. These are your chapter ideas. Then just sit down to write one chapter at a time, one per week. This way, you break it down into manageable chunks and you can be done in 10 to 12 weeks. I’ve got blog posts and videos on formatting and doing your book cover that I’ll link to but these are really the easy part so don’t stress over that. Watch this Video Series for My Self-Publishing Strategy and Beginner Mistakes that will Doom Your Books! Printables are even easier. These are just short to-the-point versions, less than 10 pages that teach someone how to do a very specific task. I like selling my books on Amazon because it’s totally passive but printables you can sell on your blog or through social media. 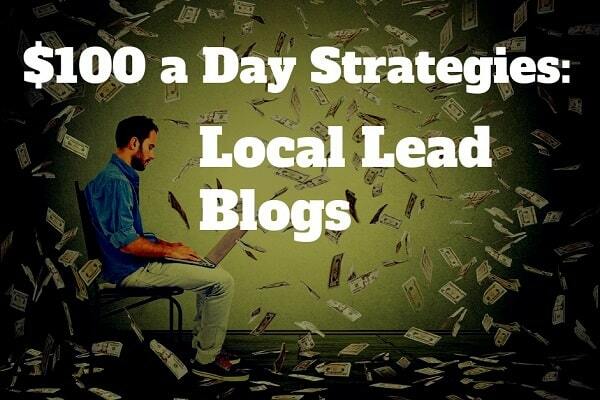 Fourth on our list of $100 a day ideas is creating local lead blogs. These are a really interesting idea I’ve been looking at lately. After creating six blogs and helping create dozens more, it’s easy to take it for granted how simple it is to start a website for a business. The fact is that most local businesses really don’t have much of an online presence beyond maybe a Facebook page. That opens up a whole world of opportunities from selling websites to managing or just consulting on how a small business owner can get that digital exposure. What we’re talking about here with a local lead blog is setting up a partnership with local businesses, a referral partnership idea, and there’s two ways you can do it. One is you set up a website specifically for the local business. You list their products, maybe even add articles to get that Google love and bring search traffic. The business owner agrees to pay you a flat rate for any visitors you drive from the blog to their Facebook page or even to their own blog. The other way you can do this is by creating a comparison website, kind of like an Expedia or TripAdvisor, but you keep it to local businesses. You can set up the same kind of per-click or commission partnership with businesses. In either of these ideas, because you keep them extremely focused to local businesses, it’s going to be easier to rank on Google. You’ll get links and mentions from other local websites that are going to boost your Google rank and you can even get local business owners to write articles for you to post. Google will tell you how much businesses are paying on average for a visitor on keywords related to your topic. This usually ranges from just under a dollar to $5 and more per visitor you send to a business. Once you get the site up and start getting steady traffic, you’ll get offers from business owners to post on the blog. Besides the advertising dollars you collect, you can also charge for these sponsored posts from $50 to hundreds of dollars each depending on the size of your site. Our fifth $100 a day idea, and this one has been huge for me, is creating a channel on YouTube. Now I’m not going to lie to you and tell you making money on YouTube is easy. I spend about 15 hours a week to produce three videos and another five hours answering comments and doing other tasks. Put in the time to build your channel though and you will make money on YouTube. I make just under three thousand a month on ads alone and average another three thousand on sponsorships on the channel. There are a lot of great channels here on YouTube about growing your own channel and I’m sharing my experience on my blog. The most important point I’ve found, and I know this doesn’t seem like much of a secret, but to just be consistent. Commit to producing at least one video a week, publishing on the same day and time every week. Put in the time to really engage with your community and put out some solid content. This isn’t something that’s going to be quick and easy. 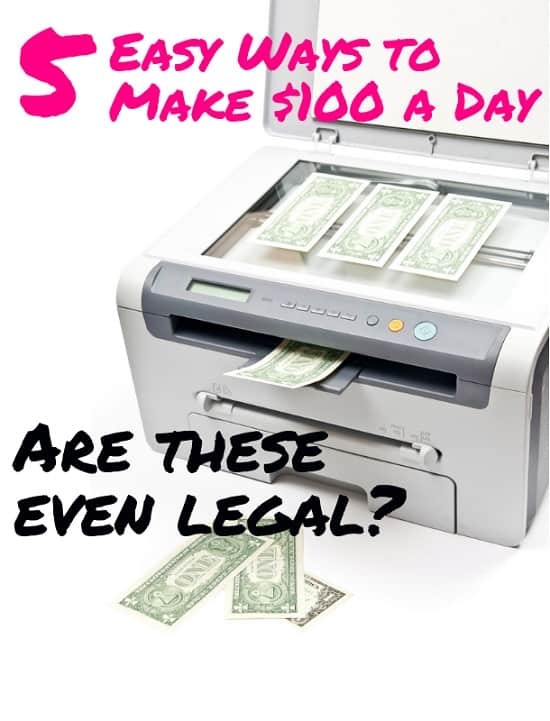 In fact, it will probably take more work than the other four ideas here to reach that $100 a day income, but you will get there and it will become passive eventually. Now I want to share three keys to making money online, three ways you’re going to unlock that $100 a day no matter which of these three strategies you follow. Our first here is going to be to focus on the long-term. Everyone wants these passive income ideas to be immediate but that’s just not how they work. If they were easy, everyone would be doing them and it wouldn’t mean anything. I know this doesn’t seem like much of a secret but I’ve been in this business since 2011 and have seen hundreds of bloggers and online entrepreneurs give up inside of six months. Don’t get discouraged or frustrated when you don’t make $100 a day immediately. Commit to giving it at least a year, no matter what. You’ll start seeing some money roll in quickly but with any of these, just one year is all it takes to have that passive income every month you can count on. The second key to success here is that you must treat it like a business. I don’t care if you’re planning on creating the next Facebook or if you’re selling the doilies you knit in your spare time. Organizing it like a business is not only going to save you money but will get you more sales and make everything less stressful. This means not only learning how to run that specific type of business but spending a little time learning basic marketing, accounting, financial management, all the roles that go into a traditional business. I know a lot of people that started their business as a hobby-job, something they just enjoyed doing and made a little money. None of them were truly successful until they took the time to learn the business side and getting organized. Our third point here is to get involved in a community of people within the niche. This means looking for those Facebook groups of other bloggers or online entrepreneurs. Not only will this be your best resource for leads but a tight group is going to support you when you need it and share all the best secrets without even having to ask. Creating and growing a business to making $100 a day doesn’t happen overnight but these five strategies will get you there fast. Remember the three secrets to making money online and build your extra income stream gradually to more than you can imagine!